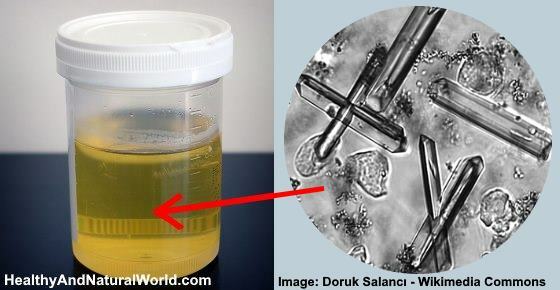 Crystals in urine are usually detected in a urine analysis. The only visible sign you may notice if you have urinary crystals is cloudy urine; however, some types of crystals in urine are not visible at all without a microscope. Your kidneys are needed to filter out waste products from the body and excess fluid, and these end up in urine. The kidneys are also responsible for regulating salt, urinary acid content, and other minerals in the urine. If you have kidney problems or your urine is too concentrated, urinalysis may show up that there are too many crystal substances in your pee. Some simple reasons for the presence of urinary crystals are because of dehydration or the side effect of medicines. In these cases, drinking more water can help return your urine to its normal color and mineral content. Doctors will usually check for the presence of an abnormally high number of crystal-like substances in urine if they suspect you have a urinary tract infection, kidney stones, or some other kidney dysfunction. In more serious cases, it’s important to treat the underlying cause of urine that contains crystal-like substances. This article looks at the various reasons why crystals can appear in a urine test and what you can do to treat the problem. First, let’s look at what urinary crystals are and why having them in your urine can sometimes be a cause for concern. When performing a urinalysis, doctors will look at the shape and structure of the urinary crystals to determine their type. Here are some of the common types of crystals that show up in urine and what they mean. Triple phosphate crystals. Composed of ammonium magnesium phosphate, these types of urinary crystals are often seen in cases of urinary tract infections and can also be associated with increased levels of urinary leukocytes. A urinalysis that shows high levels of crystals is usually accompanied by different symptoms depending on the underlying cause. For example, if you have cloudy urine from not drinking enough fluids, you may have other signs of dehydration as well bubbles in your urine. If a urinary tract infection or kidney stones are causing abnormally high levels of crystals to leak into the urine, you may also have a burning sensation when peeing, flank pain, and feel an unusually strong odor from your pee. Your urine test may also show up elevated nitrate levels in your urine. Doctors from the Mayo Clinic say that too many uric acid crystals could also lead to gout. This will cause inflammation in your joints as the crystals collect there, especially in the big toe. You will notice redness and probably experience a lot of pain. For natural ways to relieve gout pain, please read how consuming tart cherry juice can give you relief from gout. Let’s examine some of the causes of having crystallized urine and what you can do about it. At the end of the article, you can find some helpful advice on how to keep your urinary tract healthy and to avoid conditions that make crystal deposits form in the urine. In order to flush waste products from your body and reduce the number of crystals in your urine, you need to drink enough fluids. Dehydration can have serious health consequences and can cause fatigue, spikes in blood pressure, and even kidney stones. The best way to make sure and prevent a buildup of urinary crystals is to drink enough fluids. Keeping well hydrated helps to flush toxins and mineral deposits from your kidneys. One way to boost your water intake is to try one of my infused water recipes. These refreshing drinks contain very little calories but are packed with goodness, vitamins, and minerals. A urinary tract infection (UTI) can cause crystalluria, pain when urinating, a foul smell from urine, foamy urine, cloudy urine with sediment, dark colored pee and the urge to frequently use the bathroom. UTIs are caused when bacteria enter the urinary tract or you get an infection of the urethra. To help treat a UTI at its early stages, doctors from the Mayo Clinic recommend drinking plenty of water to help flush out bacteria and dilute the concentration of urinary crystals.10 Other ways to treat a UTI naturally include taking D-mannose powder, increasing your intake of cranberries and blueberries, and drinking a glass or two of diluted apple cider vinegar every day. These home remedies for urinary tract infections can only help treat the early stages of a UTI. If the infection progresses and you have a fever, dark-looking urine with a foul smell, and abdominal or pelvic discomfort, you should see your doctor. If uric acid crystals, calcium oxalate crystals, or cystine crystals don’t get flushed out of your urine, you could end up with kidney or bladder stones. If you have severe flank pain and find it painful to pee, your doctor will check for the presence of crystals in your urine. One way to help get rid of kidney stones and dissolve the buildup of stone-forming crystals is to drink apple cider vinegar (ACV). One study into the effects of acetic acid (the main component of apple cider vinegar) on kidney stones found that they help to dissolve the mineral deposits. To use apple cider vinegar to treat kidney stones, you should mix 2 teaspoons ACV in a 6-8 oz. glass of water. Drink frequently throughout the day. Continue drinking the ACV remedy until your symptoms of kidney stones or bladder stones have gone for good. Another way to help stop crystallization of your urine is to drink baking soda water. Baking soda will make your urine more alkaline and prevent kidney stones forming. It is also a natural way to reduce the pain that debilitating gout causes. Drinking baking soda will help increase your urinary pH levels, which is also associated with crystalluria. All you have to do is mix 1/2 teaspoon baking soda in a glass of water. Drink a few glasses in a 24-hour period. One of the causes of crystals in urine is taking certain medicines. As well as your liver, your kidneys play a role in metabolizing medications in the body. Depending on the interaction between various medications and the amount of fluid you drink, high levels of crystals in your urine could appear in urinalysis. If you are taking medication and you notice any changes to the color of your urine or you have symptoms like a burning sensation when you urinate, then you should discuss the matter with your doctor. If your urine is too acidic or too alkaline, you are at risk of urinary crystallization. This could increase the risk of developing kidney stones, a urinary tract infection, or blockage in the urinary tract. Drinking apple cider vinegar, although acidic in nature, actually helps to balance pH levels in the body as it helps the blood and urine become more alkaline once it is metabolized in the body. Apart from specific ways to treat medical conditions that can cause high levels of urine crystals, you can care for your urinary health daily. LabTestsOnline. Urinalysis: Three types of examinations. WebMD. Uric acid in urine. Calcif Tissue Int. 1996 Jul;59(1):33-7. Int J Res Med Sci. 2015 May;3(5):1085-1090. MayoClinic. Urinary tract infection – lifestyle and home remedies. Nephrol Dial Transplant. 1996 Feb;11(2):379-87. J Nephrol. 2010 Nov-Dec;23 Suppl 16:S165-9. AAFP. Urinalysis: A comprehensive review. Kidney. 6 easy ways to prevent kidney stones.